The Rotary Club of Findlay, Ohio, was founded in 1920 as the result of untiring efforts by one man, Bill Houck, the manager of the Boss Glove Mfg. Co. 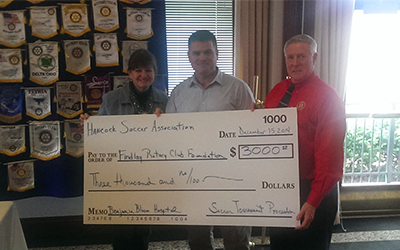 He made repeated trips to visit the Toledo Rotary Club and convinced them to sponsor a club in Findlay. His efforts came to fruition on March 1, 1920, when 28 community leaders met as Charter Members of the new club. The Rotary Club of Findlay then became a member of Rotary International, an association of Rotary clubs around the world, which today numbers almost 32,000 clubs in over 200 countries. Rotary Club "Down by the Old Millstream"
In its first year, the Rotary Club of Findlay grew to about 50 members. Today, there are approximately 200. The Rotary Club of Findlay was founded by the city's leaders back in 1920, and continues with the leaders of today. 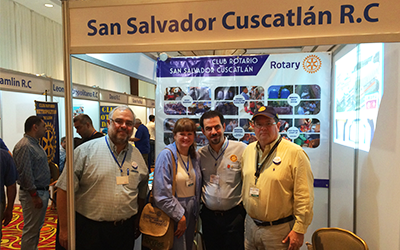 Rotarians have a reputation for generous giving at the international, national and local levels. "In 1991, the Board of Directors authorized the formation of a fund that would build over the years through donations and bequests money would be used as determined. The objective was to build a permanent fund which could make a substantial and lasting contribution to the local community. It established this special fund with a contribution from surplus monies of the Findlay Rotary Foundation, The Forward Fund." 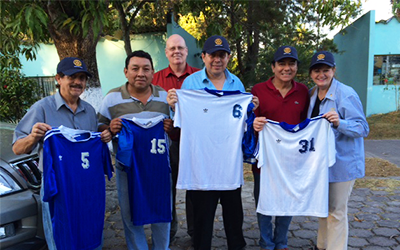 There are many ways Rotarians may support the Forward Fund. An annual dues assessment of $30 per Findlay Rotary Club member began January 1, 1995 with approval by the Foundation Board and will continue until formally altered. The Forward Fund may also be supported through outright gifts, matching funds, contributions through wills, life insurance gifts, shares of stock and memorials. The Rotary Foundation, including the Forward Fund, is a 501(c)3 non-profit organization and all contributions are tax deductible. Once a Rotarian has contributed $1,000 he/she is honored as a Forward Fund Fellow. Any contribution of less than $1,000 makes a Rotarian a Forward Fund Sustaining Member. Based on the dues assessment, all members of the Findlay Rotary Club are sustaining members of The Forward Fund and are encouraged to complete the $1,000 donation to become a Forward Fund Fellow. To date, The Forward Fund has supported a number of local programs including the Children's Immunization Program at the Department of Health of Hancock County, the Hancock County Historical Museum, Hancock County Center for Safe and Healthy Children, Findlay Area Youth for Christ, Fields for All, Miracle League of Findlay, Christian Clearing House Project Happy Feet, Crime Prevention Adapt-A-Door BOOT Security System, and Habitat for Humanity Home Repair Program.